The relentless drive against drug trafficking has netted the top five drug personalities in the province, four killed and one jailed. The unprecedented crackdown which resulted to a decline in drug operations was attributed to the assumption of Col. Dennis P. Agustin as provincial director of the Philippine National Police (PNP) based at Camp Dagohoy. As he turned one year as PNP boss here last Friday, Agustin told the Chronicle four of the the top five identified drug personalities, namely, Gerry Bunado, Owen Rosales, Junrex Mascarinas and Romulo Cano were gunned down during separate operations. Rosales, who is an ex-cop was gunned down during a hot pursuit operation following the murder of Ubay Police Chief George Cana last June 8. Bunado and Mascarinas were killed due to rivalry among drug syndicates here. Bunado died inside his car during an ambush near the Tagbilaran City Central School after collecting the day’s proceeds of a gambling operation at the City Carnival last May. Mascarinas, on the other hand, was slain at the Tubigon Public Market. The other top drug personality arrested during the watch of Agustin as PNP director was Sherwin Bautista who was collared during a raid at his city residence last year. 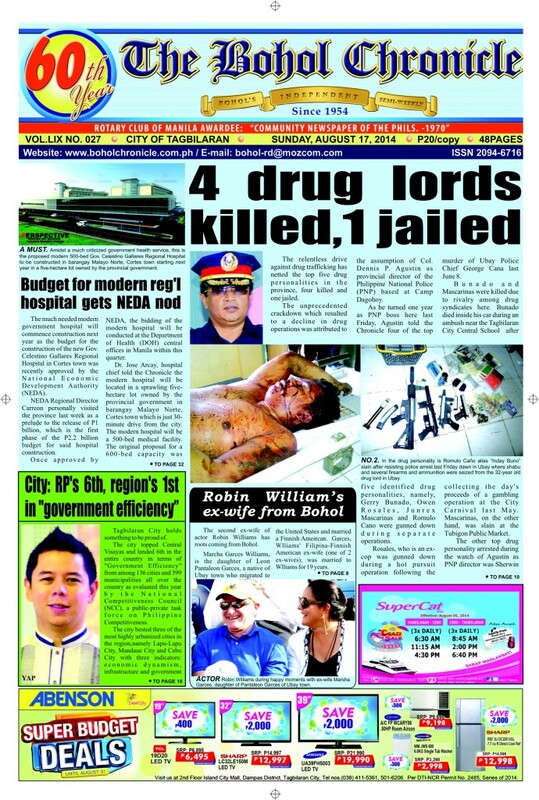 The latest slain drug leader Caño, also known as “Inday Bono,”had been out on bail after his arrest on January 10 this year for the same offenses–illegal drugs and loose firearms–violations of Republic Act 9165 or the Comprehensive Dangerous Drugs Act of 20012 and RA 10591 or the Comprehensive Firearms and Ammunition Regulation Act. Col. Agustin lauded his personnel for their commitment in the fight against drugs. In fact, he admitted that of the 47 towns, only Baclayon-PNP has not reported recent arrests on drugs. He likewise told the Chronicle that his office will soon file charges against policemen found involved in drugs. The PNP director said with this momentum in the fight against drugs, he will appeal for support from the cross-section of the community in order to sustain the success of the campaign. Agustin is slated to be invited by the Bohol Chamber of Commerce and Industry, Inc. (BCCI) to present the present peace and order condition in the province while wanting the business sector to help in the fight against crime. Just as dawn deepened into daybreak at around 2:40 last Friday, a joint team of Regional Special Operation Group 7 (RSOG7), Regional Public Safety Batallion 7 (RPSB7) and Ubay Police Station led by PSupt. Rex Derilo swooped down on two hideouts–one in the Poblacion, and another in barangay Achila. The police team conducted the simultaneous raids based on search warrants against Romulo Caño alias “Inday Buno” in his two residences in barangays Achila and Poblacion for violation of RA 10591. One split group of the police team led by Derilo and Ubay chief of police, PCInsp. Petronilo Gracia Jr., raiding Caño’s Poblacion residence resulted in a shootout when the drug suspect and his men opened fire instead of peacefully accommodating the authorities. The 32-year-old leader of the gang, was immediately brought to Don Emilio del Valle Memorial Hospital (DEVMH) but wast declared dead on arrival by the attending physician. From the Poblacion hideout, the raiding team recovered two medium size and five small size transparent plastic sachets containing white crystalline substance believed to be shabu, an AR15 rifle, two KG9 submachine gun, a caliber 45 pistol, a rifle grenade, two AR15 magazines, four KG9 magazines, a caliber 45 magazine, 18 caliber 45 live ammunitions, 45 caliber 9mm live ammunitions, cash in 247 pieces of bills of different denominations and a volume drug paraphernalia. The police team also arrested four of Caño’s companions who were caught in the act of sniffing shabu. Gracia identified the four men as Juanario Olaso Payot, 42, married and a resident of barangay Bood, Ubay; Jonathan Diacor Sarol, 29, married and a resident of Poblacion, Ubay; Felix Boyles Petes, 31, married also of Poblacion; and Joseph Japson Mendez, 38, married, also of Poblacion, Ubay. Items confiscated from Payot included one small size heat-sealed transparent plastic sachet containing white crystalline substance believed to be shabu; while Sarol, yielded one medium size heat-sealed transparent plastic sachet containing white crystalline substance believed to be shabu, a pair of scissors, a puller, an improvised tooter and cash in different denominations amounting to P330. Petes was caught having an improvised tooter and an improvised separator; while an improvised tooter and an orange lighter were confiscated from Mendez. The other split team led by PSInsp. Romeo Sentinta of the Regional Intelligence Division (RID) proceeded to the other residence of Caño in barangay Achila and the operations also resulted to a shootout, wounding of one of the men inside the house. Ubay police personnel identified the wounded person as Primo Padin Cabañero, 38, married and a resident of barangay Achila. He sustained one gunshot wound in his right chest that exited in his back and is now confined at DEVMH. Sentinta’s team caught Cabañero in possession of a KG9 submachine gun, two KG9 magazines and 52 caliber 9mm live ammunitions. The raiding team also recovered one Smith and Wesson caliber 38 revolver loaded with four caliber 357 live ammunitions during the search in Caño’s house in barangay Achila. Sentinta’s team also caught four other men in possession of prohibited items–Felixberto Cuyno Escalante, of legal age, married and resident of the raided house; Randy Bedaure Quiros, Raymond Omolon Cutaran, and Ramon Narciso Tuyae, all of legal age and residents of barangay Achila. A fragmentation grenade was confiscated from Escalante; while the three others were caught in possession of nine tin foil used as tooter, one pair of scissors, one forcep, four tin foil strips, two disposable lighters, one improvised metal plate and one roll of tin foil that served as drug paraphernalia. The four persons arrested at the Achila residence along with the confiscated and recovered items and the items found in the Poblacion residence were brought by the RSOG7 personnel to Cebu City. The four suspects arrested from Poblacion residence along with confiscated items were brought to Ubay police station for detention and other police procedures. Gracia noted that Caño, his younge brother, Arthur, and a certain Armando Aguhar Palmero had once been arrested in a raid conducted on January 10–also a Friday– by Caña’s team, in tandem with the Provincial Public Safety Company (PPSC) that doubles with Special Weapon and Tactics (SWAT) team led by PInsp. Roland Desiree Lavisto, and the Criminal Investigation and Detection Group (CIDG) led by PCInsp. Carlos Lictag led the Ubay police team. It was actually the second for Caño and last Friday’s operation was supposedly his third arrest had he not been killed. The January 10 raid also yielded a cache of high-powered firearms, ammunitions and a volume of shabu. At that time, Lavisto reported that there were actually six of them in the house, but only the Caño brothers and Palmero were actually caught in possession of the high-powered firearms, drug parahernalia, and packs of shabu. In the January 10 raid, the police team recovered one large sachet of shabu, some drug paraphernalia and money amounting to P80,000 from Caño. During the operation, the police team also recovered a Smith and Wesson caliber .38 revolver without serial number, a Colt Nickel caliber .45 pistol without serial number, another caliber .45 caliber pistol, a Colt MKIV caliber .45 caliber pistol with serial number 7686806, a Norinco caliber .45 pistol without serial number, two extended magazines of caliber.45 pistol, two hi-cap magazines of caliber .45 caliber pistol, four magazines of caliber .45 pistol, 37 pieces of caliber .45 ammunitions and four holsters–all belonged to Caño. Recovered from Palmero were a Smith arid Wesson caliber .38 caliber revolver loaded with five live ammunitions, while Caño’s younger brother yielded a Colt 1911A1 caliber .45 caliber pistol with serial number 544762, with chamber load ammo and loaded with magazine containing six ammos. Caño earlier disclosed that his supply of shabu came from Pasil, Cebu City and he would casually transport them himself onboard a passenger vessel like ordinary baggage among his clothes. Police intelligence operatives also revealed that a backroom in Caño’s house served as a drug den where users would go for a pot session. This is based on the rounds of surveillance conducted by operatives of the Provincial Intelligence Branch since first week of December last year on suspicion that the group had been into loose firearms and illegal drugs. In fact, Caño had been arrested through a buy-bust operation last year but managed to be out on bail. He was arrested again last January, and still on another bail when he engaged in a shootout with authorities during last Friday’s operation. According to Lavisto, some of the firearms confiscated from Caño in January must have been used in the recent drug-related killings, especially that the Caño brothers and Palmero were among the names squealed by one Iching Bullecer three days before she was murdered last year. Bullecer reportedly spilled the beans upon realizing that she would be liquidated because of the huge discrepancy in her remittance of the proceeds of the sale of shabu entrusted to her for disposal. Another drug personality in Poblacion, Ubay arrested about two weeks prior to the January 10 operation also pointed at Caño as his source of shabu. Another drug personality caught earlier then in Tubigon also identified Caño as his source. Caño admitted having supplied drugs to patrons in the towns—both young and old. Gracia said the rest in the Inday Bono gang will be tracked down in the days to come. The new chief of police of Ubay declared determination to eradicate illegal drugs from Ubay as a way to avenge the death of his predecessor and good friend, police chief inspector George Caña who was killed by the illegal drugs syndicate. Gracia said that in his 24 years in service, it is only in Ubay that he noted the high level of violence in the illegal drugs syndicate. He said that every time the police arrests a drug personality working for Caño, the leader of the gang would dare call them and threaten to kill them. The chief of police said law enforcers are ready to match the remaining members of the Ubay-based Inday Bono drug ring. Even if it would cost his life, Gracia said he will not leave Ubay without totally crippling the Inday Bono gang as he disclosed that he has also been a target of the group like his close friend, the late PCInsp. Caña. Gracia described the Inday Bono gang as notorious, confident with a cache of high-powered firearms. In over two decades of dealing with criminals, Gracia said it is only with the Inday Bono gang that he noted a culture of violence at a different level wherein anybody who is indebted or disappoints the group in any way gets killed. Gracia also said he is aware that it is possible the Inday Bono gang might have bribed some men in uniform. On this, the remaining sincere and dedicate police personnel stay alert against any dark designs of the traitors in uniform. The new chief of Ubay hinted that he is ready to die for his crusade, but he would make sure that he races well with time in cleansing Ubay with illegal drugs which he described as extraordinarily rampant. Col. Agustin told the Chronicle that team work of the PNP command could be a factor in the success in the crackdown on drugs and other crimes. He cited the commitment of his rank and file up to the station commanders whom he issued marching orders to go all out in the campaign against drugs as well as gambling and loose firearms. An insider at Camp Dagohoy told the Chronicle that one asset of Agustin is his ability to tap dedicated men in uniform to support his objectives. Working closely with the PNP director are P/Insp. Alvin Futalan, chief intelligence; P/Insp. Jojit Manangquil, assistant intelligence and P/Insp. Frank Villanueva, admin officer.